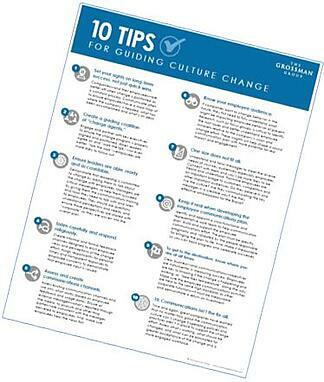 By using, 10 Tips for Guiding Culture Change, it will help set up your organization's culture change for success. On just one page you'll get 10 tips, each with a brief description on how to get there. Create a guiding coalition of "change agents"
Download—10 Tips for Guiding Culture Change—by filling out the form to the right and learn the tips you need to ensure your organization’s culture change is a success.